This was a milestone, according to the agency, which proclaimed that "a new channel" between North America and Northeast Asia had been opened. This was a milestone, according to the agency, which proclaimed that "a new channel" between North America and Northeast Asia had been opened. The trip, which had seen a ship called the Xue Long (or "Snow Dragon") travel for 2,293 nautical miles through the Canadian Arctic, had lasted for eight days and would provide "a wealth of navigation experience" for future Chinese ships, Xinhua reported. But if the announcement caused celebration in Beijing, it provoked confusion in Canada - the nation which claims sovereignty over the waters containing the Northwest Passage. The Globe and Mail reported Monday that the Canadian government considered the Snow Dragon trip a scientific research trip and that Canadian scientists were also on board. Though the Canadian government said that the trip was purely for science, some experts viewed it differently. China is "preparing for a very substantial increase in the amount of shipping," Arctic expert and professor Rob Huebert told the Globe and Mail. "It is obvious this is going into the planning to a degree that we don't see in Western shipping companies." The moved raised concern that China is preparing for large-scale shipping through the route, despite the considerable environmental concerns and disputed territorial claims in the region. China wouldn't be alone in coveting an Arctic trade route above North America. Centuries ago, many European explorers tried their luck making their way through the Northwest Passage - their shipwrecks still litter the waters. Norwegian Roald Amundsen finally completed the journey successfully in 1906. That journey took Amundsen three years. Nowadays, a fair amount of ships complete the journey in a far shorter time, but the trips are still difficult and sometimes unpredictable. Most tend to be for tourism or research, such as the one The Washington Post's Chris Mooney and Alice Li went on this summer. As more and more ice melts in the Arctic, the Northwest Passage could become a viable shipping route - something of particular interest for China, which is in the midst of a dramatic, multibillion-dollar push to create a new global trade infrastructure known as "the Belt and Road Initiative." Xinhua was clear as to why a trade route above Canada would be appealing. Under existing routes via the Panama Canal, a journey from Shanghai to New York would last around 10,500 nautical miles. However, the same journey through the northwest passage could be about 8,600 - potentially saving seven days of travel time. In April, China's Maritime Safety Administration released a guide to the future of the route. "Once this route is commonly used, it will directly change global maritime transport and have a profound influence on international trade, the world economy, capital flow and resource exploitation," ministry spokesman Liu Pengfei told state-run newspaper China Daily. China is also interested in the Arctic's "Northeast Passage," which passes across the top of Russia and allows ships to make a shorter journey that avoids the Suez Canal. The first Chinese cargo ship to make this journey did so in 2013; Xinhua reported last week that six ships have made that journey this year. Before heading to the Northwest Passage, the Snow Dragon had passed above Russia - part of a circumnavigating of the entire Arctic that was expected to take 83 days. 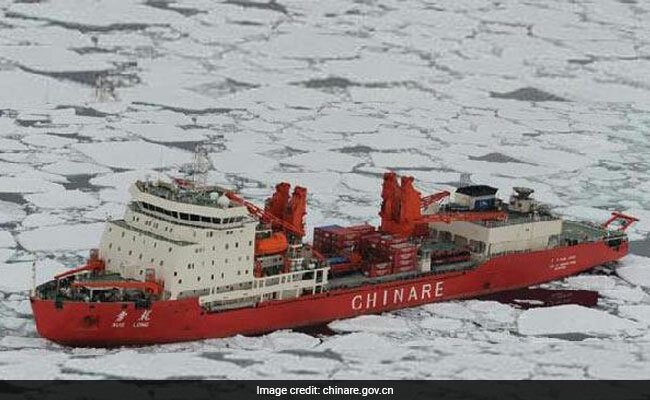 China has no territorial claims to the Arctic, but it became an observer to the Arctic Council in 2013 and it has struck up a close economic relationship with Iceland, the smallest of the member states, over the past few years. Intriguingly, the Globe and Mail noted that Beijing sought Ottawa's permission to enter the region - something that may strengthen Canada's claims of sovereignty, which are disputed by the United States and others.